so sorry for the lack of posts last week. we’ve had a crazy last few weeks being out of town a lot. we’ve been tagging along with the mr. at some conferences and living out of hotel rooms and tents, well one night. 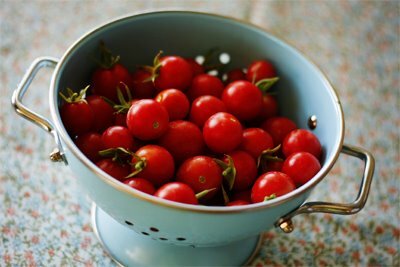 we came home last weekend to find our cherry tomato plants bursting with bright red tomatoes! i was thrilled because i’ve been waiting this moment all summer long! so, i’ve been in the kitchen a lot this past month cooking and baking up a storm. i cook often, i just love to cook! and, i’ve been trying new things. so, i hope to share some of my latest creations. so, stay tuned for a lot of recipe posts..
thanks again for those basil stems and the jalopenos. i already harvested two zucchinis from the plant you gave me, one of which i had for dinner tonight, just fried it in a pan with salt and pepper. it was really good, and i was so proud of the fact that i grew it! thanks for the plant, too! i’ll give you some when i pick more.